June 1st officially begins our Hurricane season again. Many in Florida and Tampa Bay still have last year's hurricane season in the back of our minds. Millions evacuated last September as the massive Hurricane Irma, larger than the entire state of Florida, created the largest evacuation in the history of our country. It's also time for the Metropolitan Planning Organization's (MPO) to start their federally mandated 2045 long range planning. MPO's are powerful federally mandated transportation decision making boards as all federal and state transportation funding must go through the MPO's approval process. The MPO entity itself is surrounded by a bureaucracy of staff and numerous committees. To begin the latest Hillsborough MPO planning effort, the Hillsborough MPO Board met with the Planning Commission and the Hillsborough River Interlocal Planning Board at a strategic planning retreat at Stetson University on March 23rd. This "strategic planning" retreat was attended by almost all bureaucrats with just a handful of electeds in attendance. Required attendees were the bureaucrats…..The bureaucratic Swamp is alive and well in Tampa Bay. The retreat provided input to the MPO's Unified Planning Work Program (UPWP) document. This document sets out the transportation activities the MPO will do and the products they will develop as part of the long range planning effort. Our bureaucracies now act like PR marketing entities that use our tax dollars to create campaign slogans to sell some, often orchestrated, agenda. Previous Hillsborough UPWP documents did not have slogans but this time the transportation central planners felt compelled to include one in their latest Work Plan document- It's Time Tampa Bay. Costly rail like the failed SunRail? Subsidized Transit Oriented Development (TOD) to create densities around train stations that benefits developers? Or tearing down 10 miles of Interstate 275, that serves as a major hurricane evacuation route and that hundreds of thousands of people use daily, from downtown Tampa to Bearss Avenue? Replacing I-275 with a street level boulevard and a train? And then ask taxpayers to pay for all the costly congestion creation? Scenario planning was not mentioned in previous Hillsborough MPO UPWP documents but their latest version has them. Below are the scenarios/projects documented in Hillsborough MPO's federally mandated UPWP document (emphasis mine). 1. Trend Plus, defined as continuing current land use policies with incremental expansion of the Urban Service Area in Hillsborough County. 2. Beltway and Boulevard, defined by the conversion of I-275 north of downtown Tampa into an at-grade boulevard, accompanied by construction of managed lanes on I-75 and I-4, as well as a new limited access highway in the SR 54 corridor. 3. Transit Oriented Development, focused on a rail transit line following the CSX corridor between downtown Tampa and the USF area. Scenario planning for transportation is used to consider broad frameworks not specific projects - especially at the very beginning of a planning process. This makes the Hillsborough MPO's planning process appear contrived and orchestrated. The scenarios Hillsborough MPO used in their 2040 long range planning process were broad frameworks: Suburban Dream, Bustling Metro, New Corporate Centers. Other MPO long range planning documents we looked at also used broad frameworks. There's reason to be skeptical of the Hillsborough MPO because we caught some graphs they included in the original draft version of their UPWP. One of the graphs they tried to include that reflects light rail as the top choice is below. We asked the MPO where the data came from that created this chart. We obtained a copy of polling the MPO did which can be found here. These polls were taken at some FDOT TBNext meetings, where often half the attendees were staff, bureaucrats or a member of taxpayer funded bureaucracy. Of course, some of the same people attended multiple meetings and the same person could have been surveyed multiple times. The MPO also polled their own bureaucracy (no bias for sure in their own bureaucratic Swamp). We questioned the MPO why they would include such unsubstantiated data in a formal MPO document insinuating they were valid results. Federally mandated MPO's cannot just make stuff up and manipulatively create false narratives. The MPO did remove the graphs (because they cannot substantiate the data) and replaced them with this text. The Hillsborough MPO already has begun engaging the public, via live audience polling, on what some of the major influences or “drivers” of change should be factored into the 2045 Update, as well as strategies for accommodating this growth and where resources should be focused. While this polling was not developed as a statistically significant survey, results indicate that there are people in Hillsborough County who are interested in alternatives to current trends. 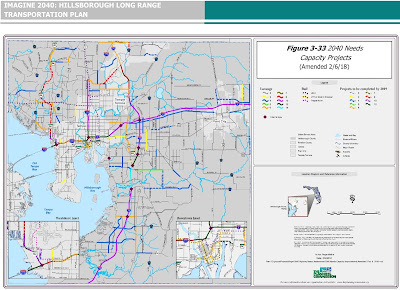 The Hillsborough MPO is currently analyzing the implications of responses to the survey, like traffic congestion and infrastructure cost, which will be assessed in a broader outreach phase to determine how widely held those preferences are. 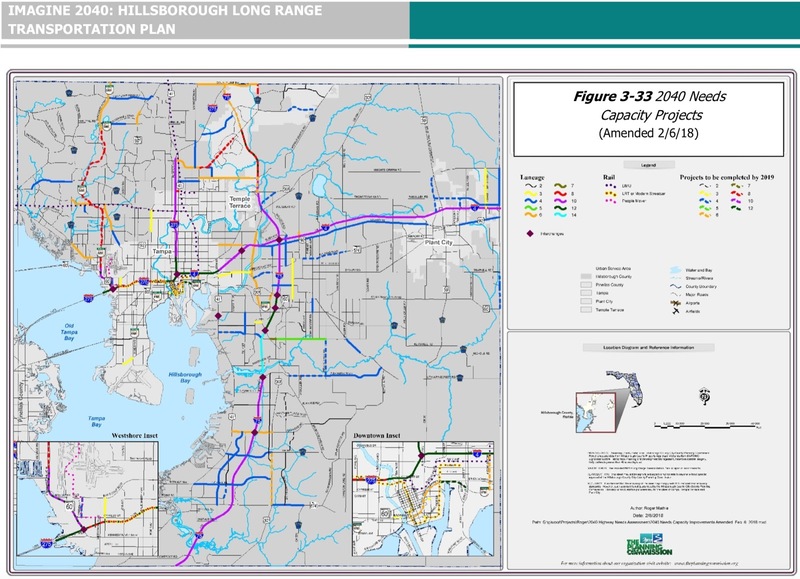 According to Hillsborough MPO's 2040 long range plan, we'll have a gridlock if we do not improve and add capacity to our entire interstate system. Below are the capacity needs from Hillsborough MPO's 2040 plan for the interstates and roads. The chart even includes costly rail lines that confirms spending millions and billions on rail does nothing to relieve congestion. 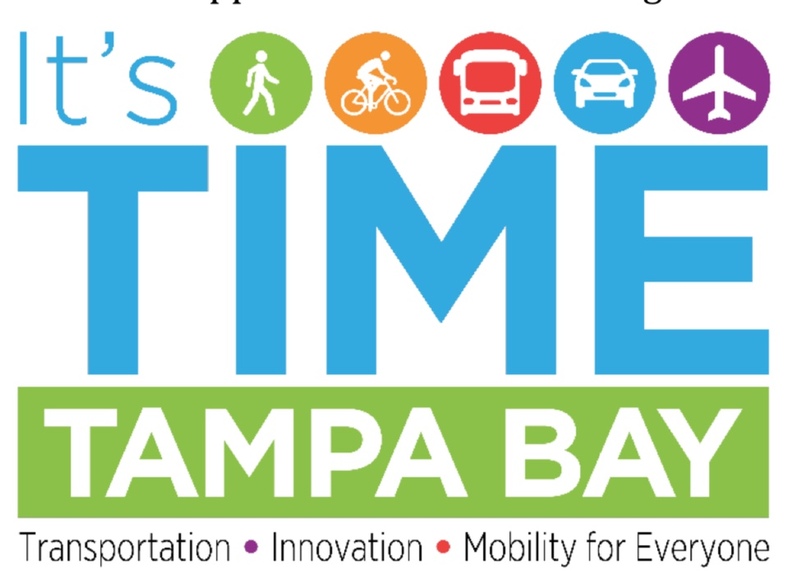 Now the MPO ignores their own previous capacity needs data and is considering tearing down I-275 from downtown Tampa to Bearss Avenue that hundreds of thousands use everyday in their latest planning process. And the Hillsborough MPO told us rail and tax hikes will be in their long range plan AGAIN. The Hillsborough MPO ignores the will of voters in 2010. They ignore those who showed up at Go Hillsborough meetings/public hearings in 2016 opposing rail and tax hikes and "demanding" our roads and highways be fixed first. While the public is being told to prepare now for the upcoming hurricane season, the Hillsborough MPO is considering tearing down 10 miles of a major interstate that serves as a major hurricane evacuation route. The Hillsborough MPO has gone rogue! Sharon, are you surprised? Nothing they do anymore appears to be "scientific", not their polling, scenario planning, traffic modeling(just ask the TBXs) or revenues. The sad part is they think the voters don't know and don't care and that the only ones who do matter are the ones who show up at their "planned public out reach". What they don't know is that they are the ones who are the greatest obstruction to transportation improvement in the county and the region. They are not being honest with themselves or us and that is why the 2045 LRTP will go the same way all the other LRTPs did "No Where". We need a new plan and way of doing this planning. Its the 21st century for Gods sake. We need a "#not againmovement" to address this before it is to late.